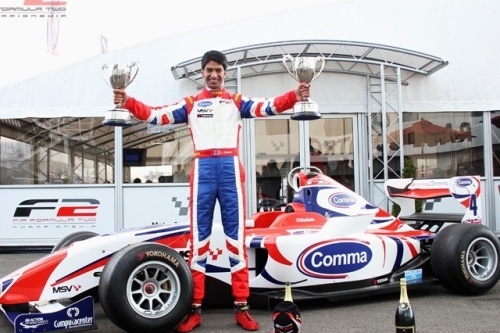 BRDC Rising Star, Luciano Bacheta pulled off a sensational penultimate lap round-the-outside passing move to make it two wins from two at the opening FIA Formula 2 round of 2012 at Silverstone on Sunday 15 April. Luciano, who started third, jumped up to second at the start and tracked every move of poleman and longtime leader Mihai Marinescu. Using his overboost on the Wellington Straight to challenge Mihai at Brooklands Luciano went to the inside, then he cleverly switched to the outside and drove right around him in a perfectly-executed manoeuvre. Despite having overboost allocation of his own to use up, Mihai Marinescu couldn't fight back on the final lap. Full Member Daniel McKenzie finished fourth and fellow Rising Star Dino Zamparelli finished sixth.